Thinking about what you can do to encourage more people to see UNREST, learn more about ME/CFS, and ACT? With the broadcast of Unrest on PBS/Independent Lens (USA), the time is now to share the film with friends, colleagues, and family members that don’t know much about ME/CFS or want to know what else they can do. 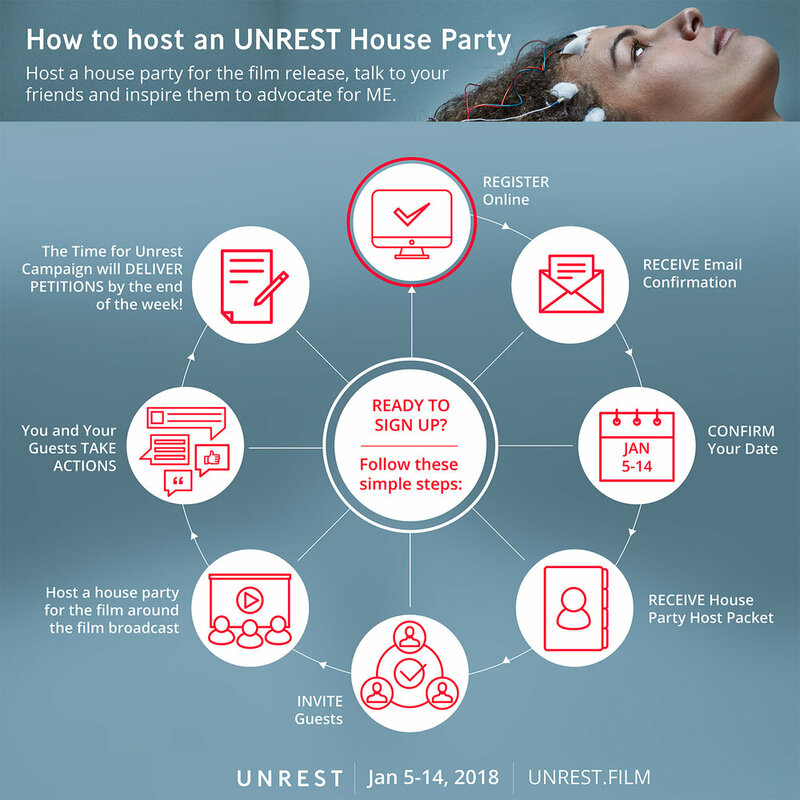 The Time for Unrest campaign is hosting a worldwide house party program the full WEEK of the PBS broadcast (January 5, 2018 to January 14, 2018)! There will be many ways for you to watch throughout the week. Host a house party, talk to your friends and family, and inspire them to advocate for ME. Interested in hosting a House Party? Sign up below and someone from our team will be in touch soon. It’s Time for Unrest! Thank you! The Unrest team will be in touch soon. It’s Time for Unrest! The mission of Open Medicine Foundation (OMF) is to fund and initiate collaborative and groundbreaking research into chronic complex diseases so that patients will be able to live life more fully. Led by their esteemed ME/CFS Scientific Advisory Board, OMF is now focused on the End ME/CFS Project, designed to find biomarkers and effective treatments for myalgic encephalomyelitis / chronic fatigue syndrome (ME/CFS). These findings should also provide insights into related diseases, such as fibromyalgia and chronic Lyme disease. In September 2017, Unrest launched theatrically in cities across the US and UK, and Australia along with a global impact campaign, Time For Unrest, which aims to increase awareness, education, research and funding around ME. The campaign consists of community screenings to engage doctors, students, scientists, policymakers, and leaders in biotech & pharma around the world. In the US, the film will air on PBS's Independent Lens in January 2018.